It was a day of celebration for the women of Dolores. The Kalipunan ng Liping Pilipina (KALIPI) was formally launched last September 25, 2012 at the Dolores Civic Center highlighted by the induction of its officers headed by its President, Ms. Jennifer Tiu Seares. The organization aims to empower the women with community activities and livelihood programs. Special Guests during the activity include Dr. Marites Beñas, the KALIPI Provincial Federation President,Ms. Decimia D. Cabang, Provincial Social Welfare and Development Officer, and Ms. Nenita Corro, supervisor at the Technical Education and Skills Development Authority. They, along with SB Members Hon. Sesy Seares and Hon. Julieta Bumagat imparted messages motivating the KALIPI to succeed in its goals. For the KALIPI-Dolores’ first activity, the Technical Education and Skills Development Authority (TESDA) was tapped and have committed to provide free skills training to members of KALIPI-Dolores on 4 different livelihood programs; Hair Science, Manicure/Pedicure, Massage and Food Processing. 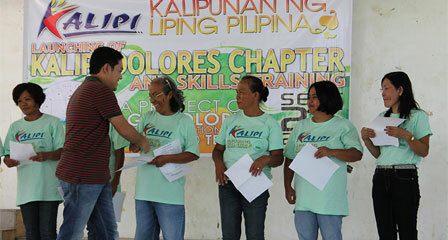 2 KALIPI members from each barangay will be trained for each program totaling to 120 beneficiaries. Training will start as early as tomorrow. Mayor JR Seares was present to administer the oath to the KALIPI officers for both the Municipal Federation and the Barangay Chapters. The Mayor also acts as the KALIPI adviser. After the induction, Mayor JR Seares took the opportunity to inform everyone of the handful of blessings the town of Dolores has just recently received and those that will be enjoyed very soon. In addition to the livelihood training TESDA is providing the KALIPI members, another livelihood project is set to be enjoyed by men and women of Dolores courtesy of Senator Gregorio “Gringo” Honasan. Meanwhile, Congressman “JV” Ejercito is providing a multi-cab to be used by the people of Dolores. The Rural Health Unit has just recently been renovated. Yet, Japan International Cooperation Agency has agreed to provide 1.5 million pesos for the construction of a bigger building and another 1 million pesos for its equipment. Very soon, the Rural Health Unit will be a lying-in clinic which means women in labor can go to the RHU and give birth there. (As of this moment, the Public Health Nurse, the Rural Health Midwife and the Municipal Health Officer/Doctor-to-the-Barrio are in Baguio undergoing emergency newborn care training). The Department of Education have also approved a proposed Classroom Building in Pacac. They have also agreed to provide 5 million pesos for the Dolores Central School. After deploying it’s Info-Technologists to a trainor’s training at the National Computer Center in Manila, the municipality of Dolores is set to receive 5 free computer units to be used in it’s E-learning Training Center. 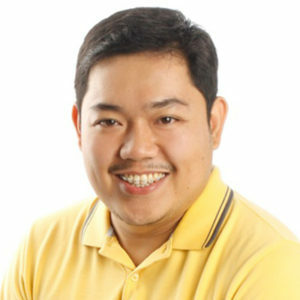 Dolorenians who wish to be computer literate will soon just need to go to the municipal hall to learn how to operate the computer. The newly procured projector would serve a great deal during these training as well as for a lot of other activities. The Mayor also reminded everyone to be patient as more Concreted Farm to Market roads are still on the way very soon. (I am informed that Senator Honasan is also funding the Mudiit to Salucag Farm to Market Road and that the paper works are 90% complete). As cherry on the cake, the Mayor informed the KALIPI members that their IDs will be made of Polyvinyl Chloride (PVC) and not paper/cardboard.This delighted the crowd who paid a mere 20 pesos as membership to the organization. He also wishes that the KALIPI becomes a self-sustaining and evolving organization by utilizing the skills and knowledge that each members will be obtaining through the various activities it plans to conduct. Ms. Marlyn S. Avila, the Municipal Social Welfare and Development Officer, gave the closing remarks. A buffet was served for the crowd for lunch as well as raffle draws for the KALIPI members. Both were funded by the local government of Dolores. Also, Mayor JR Seares and his cousin, Hon. Ryan Seares Luna contributed 6 thousand pesos distributed as prizes to 12 winners (P 500 each). Photos of the Event are available at our Facebook Page. It gives me great pleasure to welcome you to the official website of Dolores, Abra. We have always reiterated that we want to bring Only the Best for Dolores and we will undertake every means to achieve that. Not only do we aim to bring you the latest information on news, events, and activities happening in our beloved town, this portal will also serve to showcase the best of Dolores to the world! Explore our Unspoiled Rivers, Streams, and Caves, taste our Exotic Foods, visit our Heritage Sites, and witness our people perform the Sakuting, a timeless piece of Philippine culture that takes its roots from our town. Dolores is abundant with these natural and historical wonders waiting to delight you, your friends, and family. Enjoy surfing our site, and enjoy exploring Dolores. Copyright © 2019 DOLORES ONLINE. All rights reserved.